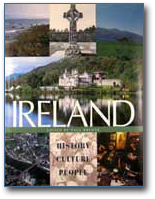 We were interested in trying to find out in what part of Co. Leitrim Terry's grandfather had lived. 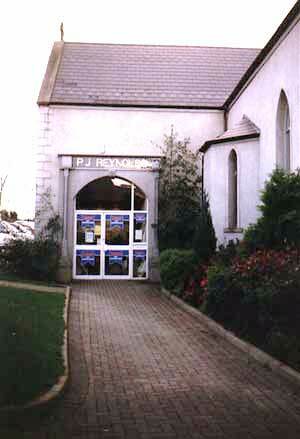 We went to Ballinamore where the Co. Leitrim Genealogical Library was located. We met James Sullivan, the librarian, but he could not give us any information we didn't already have. From there, we went to a lovely pub across the street for lunch, and the place was filled with the wonderful aroma of baking bread. There were three young people having lunch there as well. One of them was Keiran who was a butcher at the shop next door. I remember him telling us that American country music was very popular there. We decided to take a look around the town before heading back to our house in Carrick. We browsed through some of the shops and stopped to have a drink in Reynolds Pub. They told us about a hardware store up the street that was owned by Patrick Reynolds. We stopped to see Patrick but he didn't seem to have any information about Terry's ancestors. As we moved on up the hill and back toward our car, we passed by a souvenir or what-not-shop. The man sweeping outside heard our accents and asked what part of America we were from. When we said New Hampshire, he told us that his wife came from Dover, N.H. and she was back in the U.S. visiting her family. We had a nice conversation with him and went on our way, as we commented to each other what a small world it is!